China Airlines, Taiwan’s flag carrier, began operating charter flights in 1959 with fewer than 40 employees. Today’s China Airlines, which employs about 11,000 people and serves more than 100 destinations across Asia, Europe, North America and Australia, has come a long way from its humble beginnings. It flies to 10 cities in the continental U.S.: Atlanta, Boston, Chicago, Dallas, Houston, Los Angeles, Miami, New York, San Francisco and Seattle. China Airlines also serves Anchorage, Honolulu and Guam. The China Airlines fleet is among the youngest in the world; the average age of a plane is only 10 years. In addition, China Airlines constantly upgrades and modernizes its aircraft. It has lie-flat seats installed in business class on all 777s and long-haul 330s. According to travelers’ reviews, China Airlines offers great food and superb service on board. Dynasty Flyer, the airlines loyalty program, is a little unusual. There’s a bit of a learning curve, but once you get the hang of it, you’ll begin to appreciate some of its nicer features. For example: it offers a discount for redeeming two award tickets. China Airlines imposes fuel surcharges, but they have been cut almost in half since the drop in global fuel costs. Nowadays, the fuel surcharge between New York and Taipei, for example, is $55 one-way. That isn’t bad, given what some other airlines charge. How Can You Use Dynasty Flyer Miles? To anyone who is accustomed to the relative simplicity of redeeming an award seat with a U.S.-based frequent flyer program, using a foreign program like Dynasty Flyer can seem like a challenge primarily because you can’t book online. The program itself is relatively simple if you want to use Dynasty Flyer miles for China Airlines flights. It only has a few regions. It doesn’t divide Asia or Europe into many zones as other programs do, and it charges the same amount of miles for flights to North America, Europe or Oceania. Redemption rates for SkyTeam partner airlines are based on a familiar looking multi-zone chart. The challenge is when you attempt to actually redeem an award. You can’t book any awards online for China Airlines or one of its partners. One of the most fantastic features of the Dynasty Flyer SkyTeam award chart is a 70,000-mile redemption per round-trip business class flight between North and South America. This amazing redemption is only possible because Dynasty Flyer lumps all of South America into the same region. Another redemption that’s quite good is 90,000 miles per round-trip business class flight between North America and Europe/North Africa. That beats all U.S. programs and most international programs as well. Without the discount, a single business class ticket costs 135,000 miles and a first class costs 150,000. Most economy class redemption levels, with the exception of Taiwan domestic awards and flights between North and South/Central America, are less competitive than what’s offered by U.S.-based programs. 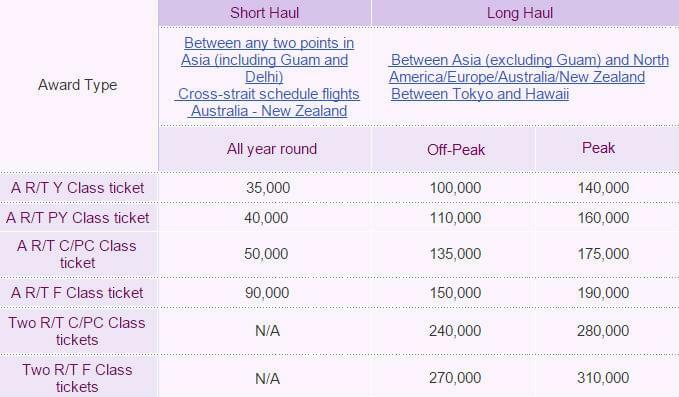 The redemption levels offered on Hawaiian Airlines, China Airlines’ only non-SkyTeam partner have a poor value as well: 25,000 for a round-trip interisland flight and 40,000 between Hawaii and the U.S. mainland. The worst possible Dynasty Flyer redemption would be an economy class award between the U.S. and South East Asia at 120,000 miles. This is more than many airlines charge for a business class award seat on the same route. Upgrades are available on China Airlines flights, as well as SkyTeam partners. You can upgrade from economy to premium economy or business class, and from business to first. A business class upgrade on China Airlines between the U.S. and Asia, for example, costs 40,000 miles per segment. 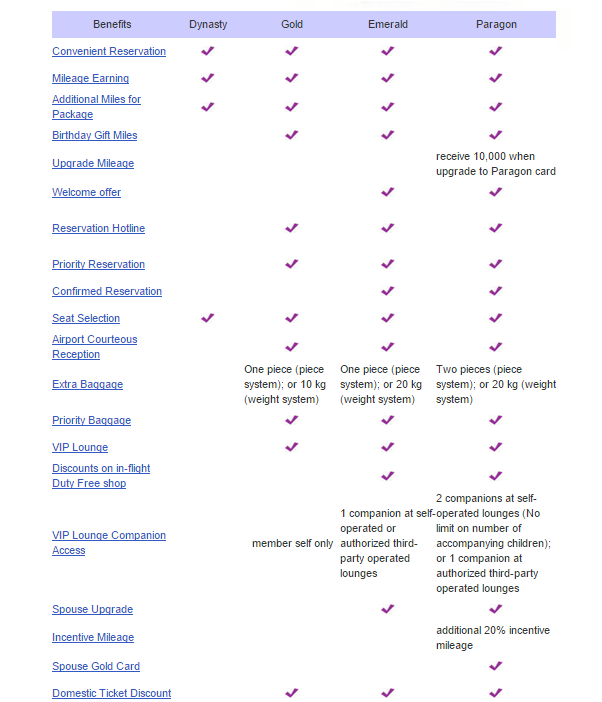 The upgrade scheme for SkyTeam partners is more complicated and based on the length of the trip. Most flights between the U.S. and Asia will cost 40,000 or 50,000 miles each way. Like most other airline programs, China Airlines prohibits upgrades on an award ticket. Dynasty Flyer has an entry Dynasty level and three elite levels: Gold, Emerald and Paragon. China Airlines does not currently offer a co-branded credit card for U.S. residents.